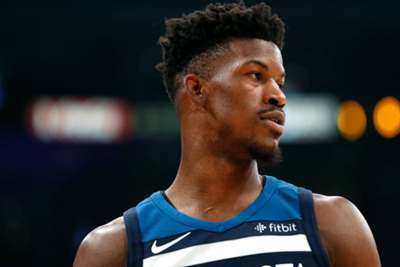 Jimmy Butler was ruled out of Sunday's game against the Portland Trail Blazers for "precautionary rest", the Minnesota Timberwolves announced. Butler, who demanded a trade towards the end of the offseason, stated this week it would be his choice whether he participated in back-to-back games or not. He has denied reports that suggested he was sitting out to force a move, instead saying his body is hurting after he missed nearly all of training camp and he does not want any soreness to escalate into injury as he seeks a resolution to his situation with Minnesota. In Butler's place, Derrick Rose could earn another start after he scored a career-high 50 points this week. A statement from the Timberwolves read: "Jimmy Butler will not play [on Sunday] due to precautionary rest. Derrick Rose (left ankle soreness) has been upgraded to PROBABALE." Butler is playing on a five-year, $92million deal. The four-time All-Star is averaging 22.3 points, five rebounds and 3.6 assists in seven games this season.